From an early child I grew up alongside the pool. As a child I couldn’t get enough of the water. I joined dive teams, swim teams, synchronized swim teams, swim camps and at age 15 got my lifeguard training certification. I taught swimming lessons all through high school and college. After college I became a Recreation Director for a large retirement community with… a pool! I worked side by side with physical therapists and physicians to develop aquatic exercises for the residents because the pool was a safer environment than land. Years passed, I got married and decided to adopt children and began a family. Shortly after we adopted 2 school age boys from Ethiopia, we began the process of adopting a girl. Six months later we got a message from the orphanage director in Ethiopia: an 18 month old was left on their doorstep. She was very sick, severely malnourished and needing immediate medical assistance. 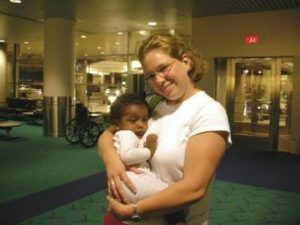 They didn’t think she’d survive much longer in Ethiopia and their government was willing to expedite her adoption so she could come to the States to receive the care she so desperately needed. We signed the papers and headed back to Ethiopia not knowing what was in store for us. At 22 months, our little baby girl came home. With a chronic fever of 104, febrile seizures, severe ear infections in both ears, giardia, pneumonia, strep throat, scabies, intestinal parasites … and the list goes on. She was 16lbs, and could barely sit upright on her own, let alone walk. She had the muscle tone of an infant. She was nonverbal, unable to even babble or mimic the sounds around her. Immediately we had PT/OT in home care daily as well as speech therapy and ongoing medical visits from a team of doctors. For a while I felt helpless. I desperately wanted to help my extremely fragile baby. So I did what I knew what to do – teach her “how to swim”. And so began a new chapter in my life. I had previously taken infant aquatic yoga classes for my 3-year-old son (who was only 18lbs and severely malnourished himself) but I needed to do more for my daughter so I researched different techniques and ways to strengthen her muscles. I needed something to help with her poor postural control, balance, coordination and eventually, gait. I was amazed at how much progress she made. She took her first steps in the water. She learned the basic concepts of crawling, reaching, turning and retrieving in the pool. The best part – she loved it! The water gave her confidence and me the reassurance that her strength will improve. And it did. 10 years have passed. My daughter is nearly 12 now. She continues to have cognitive and speech delays, but her gross motor skills are equal or better than her peers. She is turning into a beautiful young lady before my eyes! Through my daughter I found my passion in life: to use aquatic therapy to help not just children, but anyone who is health challenged, early or later in life, to feel better and have a better quality of life. 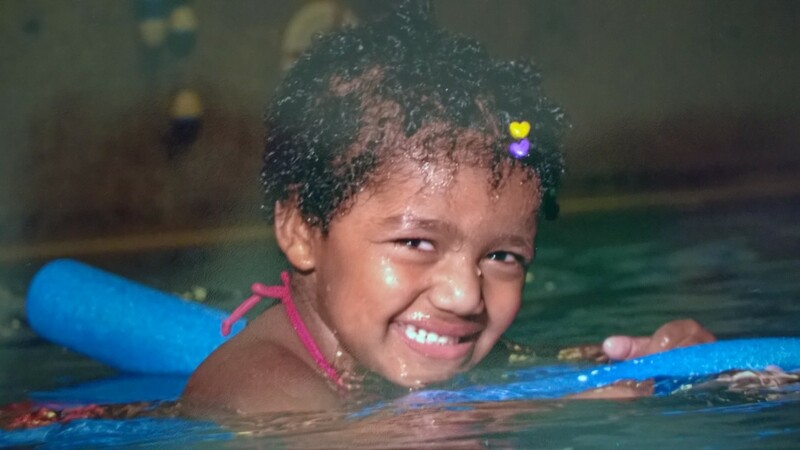 Adaptive swim lessons, aquatic therapy and aquatic exercises have the power to help those in need.